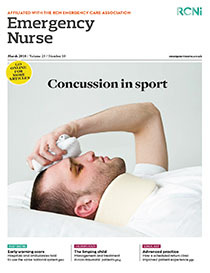 Concussion in sport is a common presentation in urgent and emergency care settings, so it is essential that nurses have a full understanding of the condition. Most patients who attend an emergency department with concussion are discharged and discharge advice must be well-informed and evidence based. This article outlines the normal anatomy of the brain and the pathophysiology of concussion, and discusses the guidelines on returning to sport following this injury.